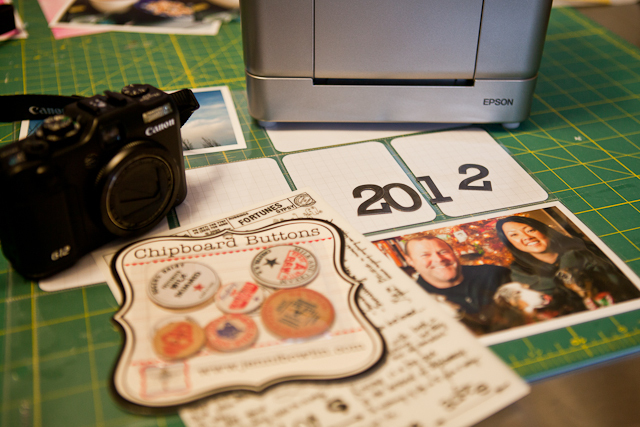 I have started Project Life - I loved Ali's reflections for her 2012 project. It really did make me think about what and how I wanted to commit to this project. One Week at a time - I have tried many times to do 365 days of photos...hasn't worked for me yet so I want to be flexible with this project. Process - I find myself journaling and making notes throughout the week and I will probably print all my photos at the end of the week to clear them off my card. Then on Sunday or Monday complete the layout. My plan is to post a quick photo either from my P&S or iPhone to my blog on Monday or Tuesday. I have determined after December Daily that I just cannot keep up with posting to my blog using my 5D which I keep in RAW file format. Album supplies - I have purchased Style A and Style D Project Life page protectors and will go back and forth with those. I might add different ones from time to time if needed. My album is an American Crafts basic D-ring black album. I did buy the Project Life kit [from last year] and now I am thinking that I should have just bought the journaling cards - my buyers remorse is that I have so much STUFF here that I could use up! So you might see a mix of things. Photos | Camera - this is the exciting part for me! Kirk gave me the perfect gift this Christmas - Canon G12 . I have been playing around with this and absolutely love it for a majority of situations. For example, I did bring it to Christmas night at my sisters and wished I had my 5D for better control in low light situations. I will be posting a review on this delightful little camera later! For this project it is going to be PERFECT. I am going to shot jpeg and there will be little to no editing of the photos. One of the things I want to go back to is just shooting and not worrying about settings. I will also be using my iPhone [which I have with me 99% of the time] I really love using the Hipstamatic app for my iPhone photos. Printing - learned another lesson from December Daily... get my handy Epson PictureMate back from my mom. Amber is always the one to enlighten me on things that will make my life easier - thank you friend! So I have this back - cartridges and paper purchased. The one I have is the Snap but it has to be at least five or six years old. I have always loved these printers. I believe that there are newer ones out there like this Epson Picturemate Charm . I learned from December Daily that using a lab was just not going to work with my schedule. Celine Navarro - more for the December Daily and all around! And anxious is see the Project Life creative team! How is Project Life coming along for you? Looking forward to keeping up with you on your progress during the year. Like you I'm going to be doing the weekly thing but I'm still getting my album set up. :) I bought the kit along with the variety pack. Paula what a super project. You are always such an inspiration to me, and I would love to do something like this but it just feels so daunting! Perhaps I'll consider adjusting so that it works with my lifestyle. @The Divine Miss KeaYou are too sweet Kea - This project is totally adjustable. I think some days will just have journaling and ephemera from the week. Other weeks will be all photos...you could totally do this!! I'm so excited for you to tackle this. I already started putting my week together, as we are going out of town tomorrow, and am going to put that separate. But that's why I'm being flexible! I had a little hiccup with my printer, but I think I'm good. Did you know you can do a two up on the 4x6 with in lightroom to print photos to for the little spots in the page protectors? You just choose "custom package" (upper right) and then uncheck "lock to photo aspect ratio" (under cells) to resize if needed. I love it. Oh and one more tip; I traced the grid card (both ways) onto my trimmer so I could cut down stash/ephemera/photos quicker for the small spots.